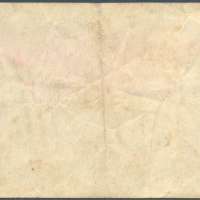 Issued on 15 August 1940 and used until demonetised on 31 August 1948. Designed and printed The Survey Department, Federated Malay States. Printed on white watermark paper (MSD) and a map of Malaya. Portrait of King George VI. Because of the outbreak of war in Europe, there was a currency shortage due to silver coins hoarding as the intrinsic value of the metal was greater than the face value of the coins. In needs to meet for small change, the Survey Department printed 10 and 25 cents in Kuala Lumpur for circulation. An order was placed for 2,000,000 notes on 17 July 1940 and later delivered on 20 August 1940. The Malayan dollar was issued by the Board of Commissioners of Currency, Malaya, with a hiatus during the Japanese occupation (1942–1945). 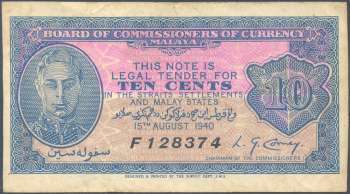 The Board of Commissioners of Currency Malaya came into being in October 1938 following the Blackett Report which recommended that the sole power of issuing currency for the various Malay States, including Brunei, and the Straits Settlements should be entrusted to a pan-Malayan Currency Commission. Sir Basil Blackett was appointed in September 1933 by the Secretary of State for the Colonies to lead a commission to consider the participation of the various Malay States, including Brunei, in the profits and liabilities of the Straits Settlements currency. The Blackett Report was adopted by the Government of the Straits Settlements, the Federated Malay States, Unfederated Malay States and Brunei. Legislation was enacted by the Straits Settlements Currency Ordinance (No. 23) of 1938, and ratified by the various states during 1939. The board started to issue currency in 1939. DESIGNED & PRINTED BY THE SURVEY DEPT. F.M.S.